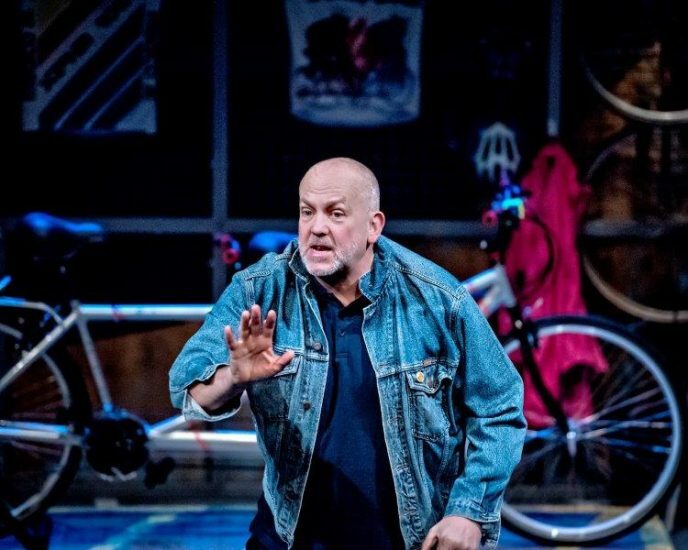 Scary Bikers rises and shines on the stage of the Trafalgar Studios 2, and if you’ve never been, you’ll find it’s a small and cosy place, perfect for a light-hearted comedy of this kind. 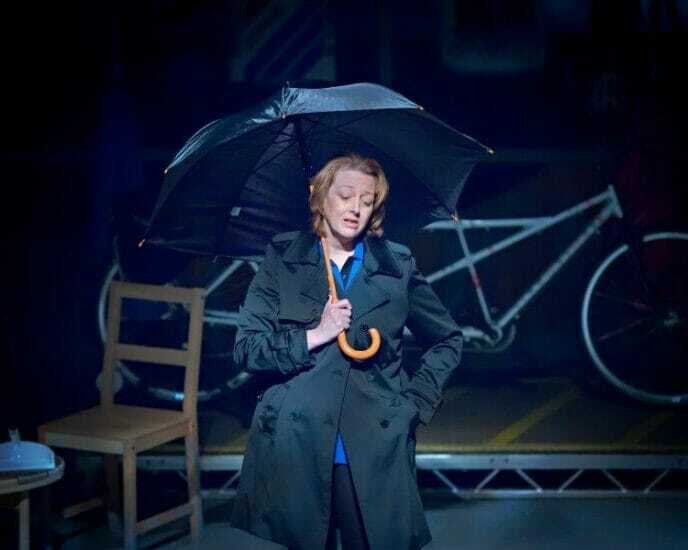 Written and co-directed by John Godber, who also makes up one half of this two-hander, it runs at Trafalgar Studios until 27th April. Scary Bikers peeks into the lives of Don and Carol, both trying to overcome the recent loss of their significant others. Being left on their own after so many years of marriage, they feel lost, and not quite ready to move on. They meet in an unusual and slightly awkward way, and without spending too much valuable time to get to know each other, they decide to head on a bucket list bicycle journey from the UK to Florence, and they do so very optimistically, without much preparation, which unsurprisingly plays a big role in the execution of the trip. 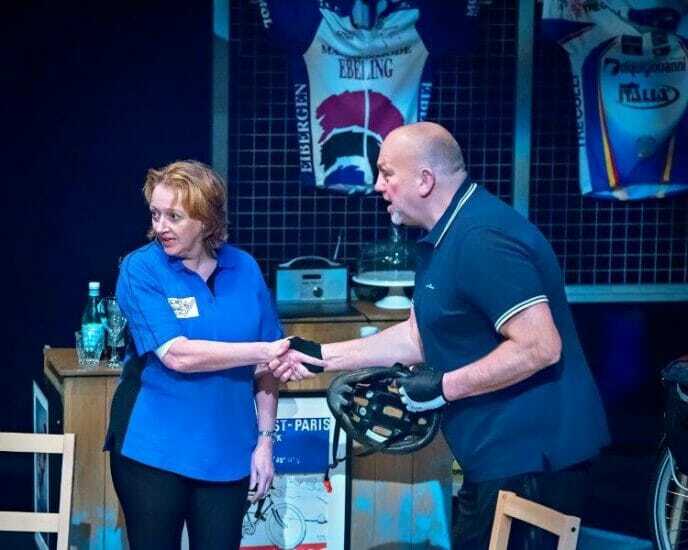 John Godber and Jane Thornton are both acclaimed and experienced actors but most importantly, the only actors in this play. They succeed in delivering a strong and heart-warming performance and do particularly well with keeping the audience engaged throughout, with direct storytelling and jokes that make even the bitter moments laughable and more acceptable. One actor playing two different roles can either confuse the audience or truly demonstrate the actor’s craft. This one undoubtedly does the second, resulting in deserved admiration for the duo. 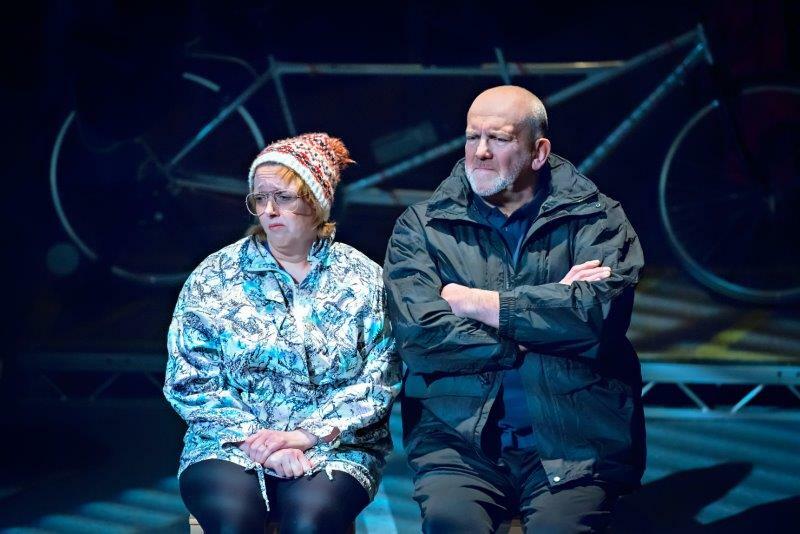 Godber and Thornton make the switch from different characters clear with just minor adjustments; changing of the voice, mimic or a piece of costume. 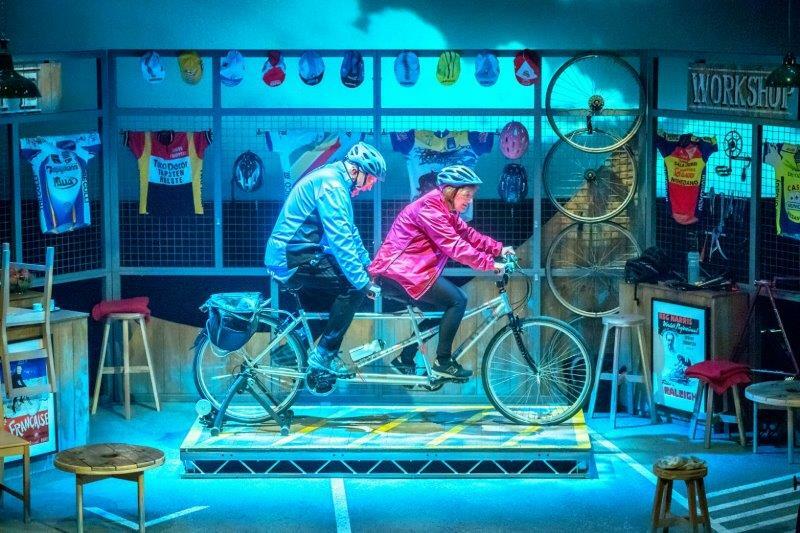 In the execution of Scary Bikers, the music represents a significant role, as it helps transition the play from one place and time to another, and sets the right tone for their adventurous Euro tour. The set design is just right for the small space the play was executed in. The great number of props piled in to the set keeps the stage interesting, and helps in telling the story without taking too much attention away from the actors. Although younger audiences might find it harder to relate to themes such as loss of loved ones, everyone will almost certainly be able to engage when the Brexit remarks start flying around. However, the play still remains an easy to follow comedy that doesn’t force, or require any opinions on that particularly divisive matter. If anything, it will make a miserable day better, and show that even in dark days one can discover joy.